i'm new to the forum, and as i now live in Japan as an English i havbe plenty of time on my hands. 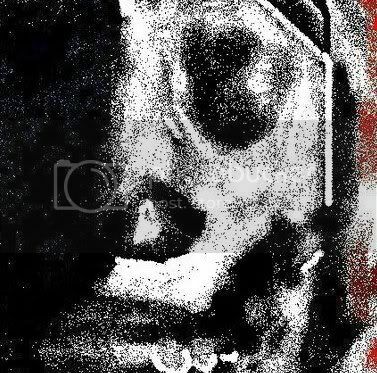 This meant to spending alot of time at my cpu desk doing nothing and with this time i thought i'd get back into the world of silent hill and rekindle my love of discussing theories with like minded followers of the series. I don't know how many of you have played silent hill arcade, if you have you would also agree with me that your very suprised. I read about the game over the internet and forums, people were comparing it to "house of the dead" and other light gun games. It is the same in the sense its a light gun game, but the experience is very different. The game far surpasses any exspectations a fan would have, because i'm sure like me you were cynical and doubted how any sh game could be put on the arcade. This game is no where near the experience of the games to have graced the consoles and the arcade game is not as scary as there is really no psycological fear there, but its not as fast paced as other light gun games and the enemys look incredible with the graphics sublime. It is different to other sh games (obviously) but it is also different o light gun games, the pace is slower and the enemies and few and far between which adds to the atmosphere, ph looks amazing, the only problem i have is that it seems to take mre from the movie then the games in terms of look and feel. I really, really believe this is the best light gun game in the arcades. if anyone has any questions about the game, chracters, enemies etc. please reply and ill do my best to answer, only got to the first ph on the boat, which is about 40 minutes into the game, the people i was with didnt want to hang around, but going osaka again shortly il have another go. People who havent played the game shouldnt criticise at all. here are a couple of pictures i took while waiting. Sounds cool, thanks for the info and pics especially. nice setup. i love that picture of pyramid head. i'll definately play it if it ever comes out here... though i can't imagine spending hours trying to finish it in one sitting. there was like a big que for it, but there didnt seem to be many machines knocking about. I'm going to the Osaka gameshow next week if there are any sh related things, ill take pictures etc. but silent hill is not very big over here at all, i ask students about it and they have no idea. People who havent played the game shouldnt criticise at all. Do not try and bend the spoon. That's impossible. Instead... only try to realize the truth. There is no spoon. I have not played it, but I would LOVE to! I am totally interested in it. I have to say that any game that explains more about the town interests me. I hope it comes to the states very soon! 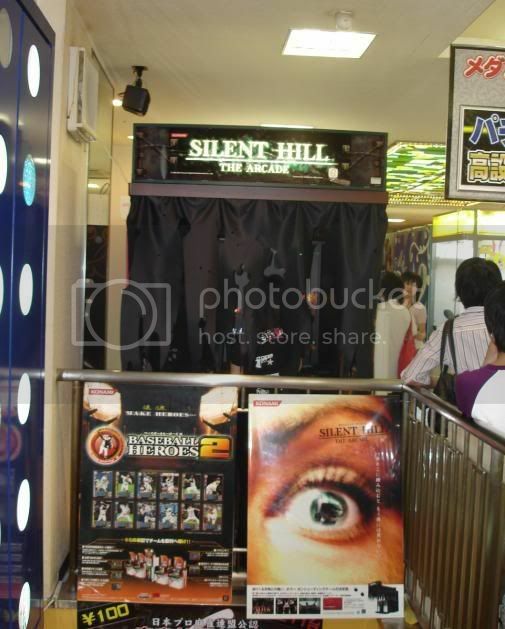 those drape-like things are kind of tacky though... the cabinet designers don't relish the idea of spectators to encourage other people to try it and are simply relying on that poster of Pyramid Head? I think it adds to the atmosphere. It looks great. I hope it comes to the US, but I also hope they make it available for home platforms as well. yeah it certainly does, there is another version of it as well in which you stand in a box. The interior is all black and the its surround sound. Even though critiques could argue its a move to make sh even more commercial or its a money making ploy, i beg to differ because Y200 (about $1.5) lasts ages as there are not as many enemies on the screen at once with plenty of cut scenes so the game doesn't aim to get the player off straight away like HOTD or Virtua cop. I hope everyone plays it because you will all be so surprised. 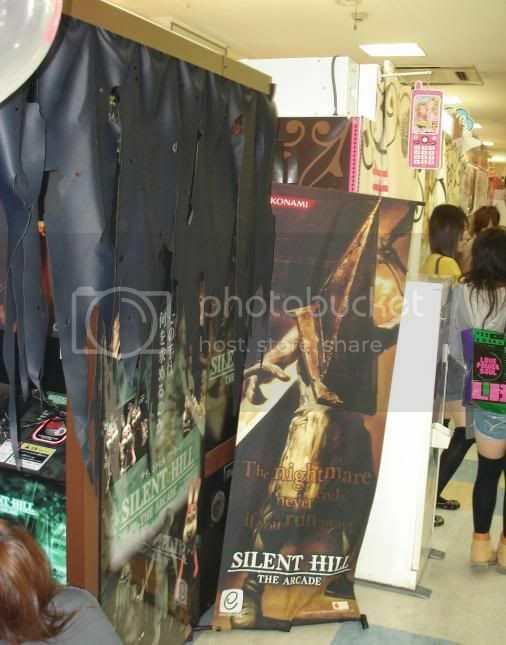 I really like that PH banner as well, especially since it's PH from SH2. Sounds interesting how the monsters are few and far between being as it gives more of a feel for exploration, nice touch. 40 minutes? I didn't know these games could least even that long! could you write about the various sections of the game and it's story, for example from all the clips I have seen it looks as though Silent Hill: The Arcade takes place in Brookhaven hospital, but the story is about The Little Baroness. How does that work, and what is the story behind The Little Baroness, and what are Scrapers doing in this story, is there a reason for them? yeah, what is up with the Litltle Baroness? I have been curious about that for ever. Thank you so much for your report! If you have any more info on the game please share it with us since many of us may not get to play it! And I want that Pyramid Head banner. Me too. I really really want it to be released in the U.S. as in yesterday! >I really like that PH banner as well, especially since it's PH from SH2. That's the red pyramid thing from the movie, not Silent Hill 2. >Why would they release the game in Japan just to have it in english? Spoken dialog in all Silent Hill games are done in English as opposed to Japanese. Methinks the versions released in Japan were Japanese-dubbed. It's the exported versions that were in English.